Lonnie Wheatley, MESQUITE, Texas (April 27, 2018) – When you’re hot, you’re hot. 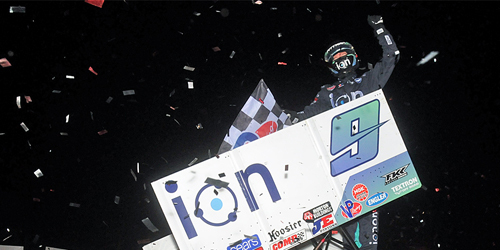 And Daryn Pittman is scorching hot right now after picking off his third Craftsman World of Outlaws Sprint Car series win over the last four events by winning Friday night’s 25-lap Texas Outlaw Nationals opener atop the ½-mile Devil’s Bowl Speedway clay oval near Dallas. Pittman caught a reprieve in this one after snaring his initial two wins of the season last weekend at West Memphis and Pevely. This one came when the initial start was waved off. On that initial start, new track record holder Jason Johnson had rallied by on the top side and stretched out an immediate lead only to see it negated a when a car came to a stop off the top of turn four before the opening round was completed. But The Ragin’ Cajun’s hand had been tipped and Pittman would have no more of that. Pittman worked the top on the restart and jumped into a lead he would never relinquish on the restart. Traffic did keep things interesting though, with Johnson closing in on the Owasso, OK, native when a caution midway through the race gave Pittman clear sailing once again. Opting for the outside lane on the restart, Pittman took off again with Logan Schuchart dashing past Johnson for second. Schuchart and Johnson kept Pittman in sight and closed in again as traffic became a factor over the closing rounds. But neither could take advantage with Pittman matching his win total from a year ago with boss Kasey (sixth-place) in the house. Pittman crossed the stripe ahead of Schuchart with Johnson in third. Reigning WoO king Donny Schatz was fourth with Brad Sweet rounding out the top five. Fast Qualifier: Jason Johnson, 13.306 seconds – Broke 19 year-old track record. Heat Winners (starting position in parentheses): Johnson (1), Stewart (1), Schuchart (2). Original Start – Ryan Robinson slows atop turn four to bring out the caution before the opening round was completed. 13 Laps – Channin Tankersley slows aboard the Old School Racing entry to give everyone a quick breather. “A” Main Hard Charger: Sheldon Haudenschild gained a handful of positions by climbing from 14th to ninth. The Wheatley Chronicles brings insight and highlights from all variety of racing series throughout the nation in 2018 and beyond along with the Open Wheel Power Rankings. Please send any comments, questions or advertising inquiries regarding The Wheatley Chronicles at www.sprintcarmania.com to Lonnie Wheatley at lonniewheatley@gmail.com.